Police officers near Sennaya Ploshchad station of the St Petersburg metro in the aftermath of an explosion which occurred in a train at 2:40 p.m. Moscow time. A blast ripped through a carriage between the stations of Sennaya Ploshchad and Tekhnologichesky Institut at 14.40 local time. According to the Russian Minister of Health Veronika Skvortsova, ten people are dead and 47 injured. A bomb exploded in a subway car as it was travelling between the Sennaya Ploshchad and Tekhnologichesky Institut metro stations in St. Petersburg at about 3 pm Moscow time on April 3. At least ten people were killed and 47 hospitalized with injuries, according to Russian Health Minister Veronika Skvortsova. The Russian Investigative Committee said the explosion was a terrorist attack, adding that it is considering other versions of the tragedy. 9:01 p.m.: UN Secretary-General Antonio Guterres has condemned St. Petersburg’s metro blast, saying those behind the attack must be held accountable. "He [The Secretary-General] extends his deepest sympathy and condolences to the families of the victims and to the Government and the people of the Russian Federation. Those responsible for this appalling act must be held accountable," Spokesperson for the Secretary-General Stephane Dujarric told reporters. 8:16 p.m.: "Three-day mourning is declared in the city from tomorrow on orders of St. Petersburg Governor Georgy Poltavchenko," governor’s spokesman Andrey Kibitov wrote in his Twitter account. ВНИМАНИЕ:По распоряжению губернатора СПб Г.Полтавченко с завтрашнего дня в городе объявляется трехдневный траур. 7:19 p.m.: Seven people died at the scene of a blast in St. Petersburg’s metro, one person died in an ambulance on the way to hospital and two died at the hospital’s reception ward, Russian Minister of Health Veronika Skvortsova told journalists. 6:55 p.m.: The professionalism of the train driver helped avoid more deaths in the St. Petersburg subway blast, said the spokeswoman for Russia’s Investigative Committee, Svetlana Petrenko. "The blast occurred between two stations and the driver made absolutely the right decision not to stop the train and proceeded to the station, which helped launch the evacuation immediately and provide assistance to those injured," she said, TASS reports. 6:22 p.m.: Two of those injured in the St. Petersburg metro explosion have died in hospital, Russian Minister of Health, Veronika Skvortsova, told journalists. "Thirty-nine people were taken to hospital. Two of them have died, six are in a critical condition. The rest remain in a fairly serious condition," she said. 6:15 p.m.: The photo of the suspect has been released to the public. 5:45 p.m.: A CCTV camera in St. Petersburg has reportedly recorded a suspect, Interfax writes. 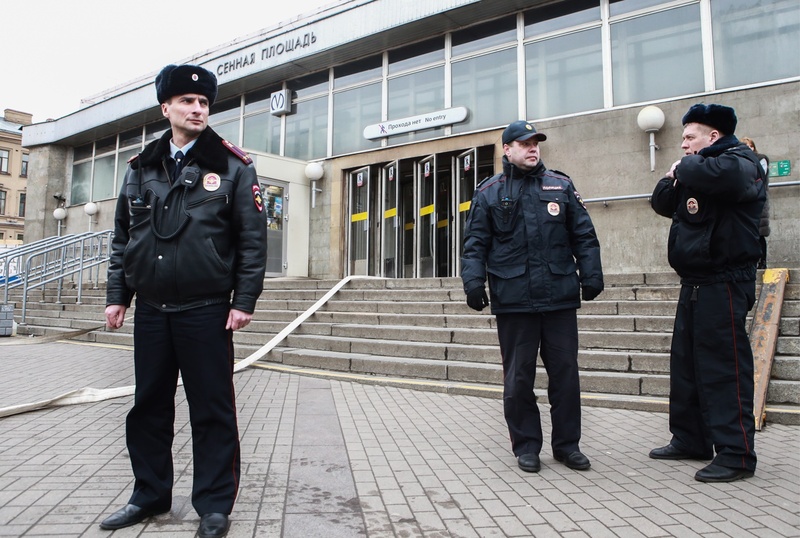 5:40 p.m.: The National Anti-Terrorist Committee has confirmed that a makeshift bomb was found at the Ploshchad Vosstaniya metro station in St. Petersburg, and disposed of – spokesman Andrey Przhezdomsky told the Rossiya-24 television news channel. 5:36 p.m.: "Everyone in the metro carriage already had their mind set on death, so to speak. But we were taken out after the blast and people began helping each other, and carrying people out of the carriage, many were covered in blood," an eyewitness told TASS. Another eyewitness said that people were waiting to be evacuated for several minutes. "I saw the dead, at least three or four people. Emergency services arrived at the scene five to seven minutes later." 5:20 p.m.: The National Anti-Terrorist Committee: "According to early data, nine people died in the St. Petersburg metro blast, and more than 20 were injured, some serious. All the injured are receiving the necessary medical and psychological aid." 5:10 p.m.: The U.S. Embassy in Russia conveyed its condolences to the families and friends of those killed in the St. Petersburg metro blast, the embassy’s spokesperson Maria Olson said. 5:07 p.m.: St. Petersburg Governor Georgy Poltavchenko confirmed that 10 people have been killed by the metro blast. “Ten people died and about 20 others have been injured,” he said. 5:06 p.m.: German government spokesman Steffen Seibert wrote on Twitter: "We are receiving terrible news from St. Petersburg. We express condolences to all the victims and their families." I am shocked and saddened by the news of deadly blasts in St Petersburg. I extend my sincere condolences to our member state #Russia. 5:03 p.m.: Information about the unexploded bomb has not been confirmed. "An unidentified object was found at Ploshchad Vosstaniya station," a RIA Novosti source told emergency services. 4:57 p.m.: The Pulkovo Airport press service says reports that the airport is closed are not correct: "Pulkovo Airport is open. Planes are arriving and departing on time." Security measures have been tightened though. 4:44 p.m.: According to St. Petersburg governor’s office, all public transport has been instructed to carry people for free, Fontanka.ru reports. 4:37 p.m.: People have been evacuated from St. Petersburg's metro after the explosion, Andrei Przhezdomsky, spokesman for the National Anti-terrorist Committee, told the Rossiya-24 TV channel. "So far, we are calling it an unidentified explosive device as investigators and the Federal Security Service's bomb specialists are still to establish the cause of the blast." 4:31 p.m.: A massive traffic jam was reported in the center of St. Petersburg after the attack on the subway. Yandex.Taxi and Uber say all taxis were booked. A free bus has been arranged between metro stations. 4:27 p.m.: Fontanka.ru's source reports that St. Petersburg's Pulkovo airport has been put on red alert. All personal belongings are being checked. All available police and FSB operatives are engaged. There is evidence that some aircraft which have already taken off are being returned to the airport. 4:23 p.m.: "The timing for the terrorist act was perfectly chosen. At the time there are usually many people on the metro, but it is not crowded. Too many people would be undesirable for terrorists because the blast would be less effective in highly packed crowds. Several people will be hit by splinters and blast fragments, but there will be fewer casualties." - A source from the Ministry of Internal Affairs told RBTH. 4:20 p.m.: "The explosion occurred in the tunnel when the train was moving between the stations of Sennaya Ploschad and Teknologichesky Institut. It happened in the third car of the train, when it was partially in the tunnel," reports Interfax. According to eyewitnesses, after the explosion the train didn't stop and continued to Teknologichesky Institut station. 4:13 p.m.: "As it stands, there are about 50 injured people. Medics are with them now. There are currently 17 ambulance teams and the number will be increasing," spokesman for the city's governor Andrei Kibitov said. 4:04 p.m.: According to an Interfax source, the explosive device "was left" in the subway. It's not confirmed if a suicide bomber was involved. The unexploded bomb has reportedly been found at Ploschad Vosstaniya station. 4:00 p.m.: "Fontanka" reports an unexploded bomb was found (their website is down). 3.59 p.m.: Facebook has launched a "safety check." St. Petersburg residents can now inform their friends and family that they're safe. 3:58 p.m.: Locals are writing on social media that communication is down in some St. Petersburg districts - Gazeta. ru reports. 3:55 p.m.: "We are investigating if there was a suicide bomber on the subway. It is clear that security measures at the entrance to the metro stations are not working. There is a very high probablity that it was a terrorist attack, because it is impossible to get something (other than a bomb) like a gas cylinder underground. Information on terrorist threats on transport and in public places was being recieved by the authorities and security measures were taken." - RBTH source in the reigonal department of the FSB. 3:54 p.m.: Authorities of the Moscow metro have implemented extra security measures after the blasts in St. Petersburg, according to a statement on Telegram. 3:47 p.m.: "The cause of the blasts are not yet clear, it's too early to say, the investigation will show what happened. But of course, we are taking all options into account. Early indications show it might be linked to terrorism," Putin said. 3:40 p.m.: All metro stations are closed as of 15:40 local time, the metro's Telegram channel reports. 3:39 p.m.: According to early information, two small explosions hit the center of a carriage on St. Petersburg's metro, writes Gazeta.ru. 3:37 p.m.: Russian President Vladimir Putin has been informed about a blast in a St. Petersburg metro station, his spokesman Dmitry Peskov said. 3:29 p.m.: Seven metro stations have been closed in St. Petersburg after an explosion hit a metro car, the metro’s press service said in a statement. "Park Pobedy, Elektrosila, Moskovskiye Vorota, Frunzenskaya, Tekhnologichesky Institut, Sennaya Ploshchad, and Gostiny Dvor metro stations have been closed," it reads. The metro’s press service also said passengers were being evacuated while casualties have been reported. 3:25 p.m.: The explosion happened during a speech by Vladimir Putin at a media forum . An explosion struck a metro station in Russia’s second-largest city St. Petersburg, leaving several people injured, a local law enforcement source told TASS on April 3. "A blast occurred at Sennaya Ploshchad metro station, several people have been injured," the source said, adding that the station has been overtaken by smoke. A spokesman for the regional department of Russia’s Emergencies Ministry said it was checking reports on the smoke in the metro. "There is a complaint about the smoke, the staff members are going to the scene," he said.